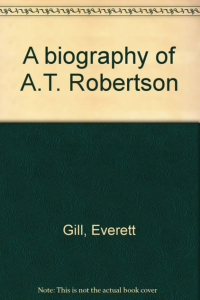 Archibald Thomas (“A.T.”) Robertson was born November 6, 1863 and died September 24, 1934. He was a Southern Baptist all of his life and arguably the greatest Greek Grammarian of the last and present centuries. This story of his life is told by a colleague in a personal and delightful way. This is a stirring story of scholarship and personal integrity in the post war South.